This article will show you how to back up your computer's local user profile, which is stored on your computer's hard drive, to either your P: drive, Google Drive, or an external device such as a USB flash drive or external hard drive. Instructions are included for both Windows and Macintosh. If you have questions about these procedures or run into difficulties executing them, contact your Computing Coordinator. 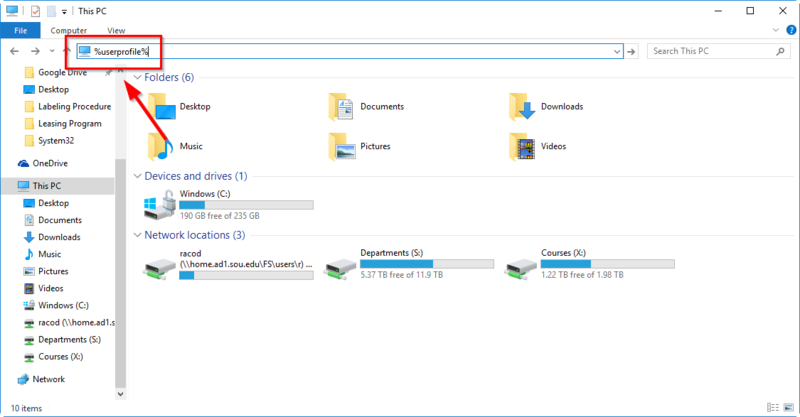 To locate your local user profile, open File Explorer on your computer, type %userprofile% into the path bar, and press Enter. You can launch File Explorer by pressing Windows Key + E on your keyboard, which works for all versions of Windows. With Finder selected (click anywhere on your desktop), click on Go in the menu bar along the top of the screen and then select Home from the dropdown menu to access your local user profile, or use the keyboard shortcut Shift + Command + H.
After you have selected the folders you want to back up, you need to copy them to your computer's clipboard by pressing Ctrl + C on your keyboard or by right-clicking on any of the selected folders and selecting Copy from the menu. After you have selected the folders you want to back up, you need to copy them to your computer's clipboard by pressing Command + C on your keyboard. You can also copy the folders by holding Ctrl on your keyboard, left-clicking on any of the selected folders, and then selecting "Copy X Items" from the menu, where X will be replaced by a count of the folders you have selected. Now that you have copied the folders you want to back up, you need to create a new folder on your P: drive to hold them. You can do this by navigating to your P: drive and pressing Ctrl + Shift + N on your keyboard. Name the folder something descriptive and then press Enter to lock in the name. Follow these instructions to connect to your P: drive, then create a new folder there by clicking on File in the menu bar, then selecting New Folder. You can also use the keyboard shortcut Shift + Command + N.
After creating the folder, select navigate down into it by double-clicking on its icon.